Putting The "F" Back In Freedom. It is a sad day for movie fans in the United States, as Sony has officially cancelled the release of Seth Rogen & James Franco's new comedy The Interview thanks to hacker terrorist threats. Everyone has been following the Sony Pictures Hack story for weeks, as the studio was hacked and files have been leaking non-stop. Today, after movie theaters backed out due to an actual threat of harm to anyone attending screenings of the movie, the studio has decided to pull the release entirely. 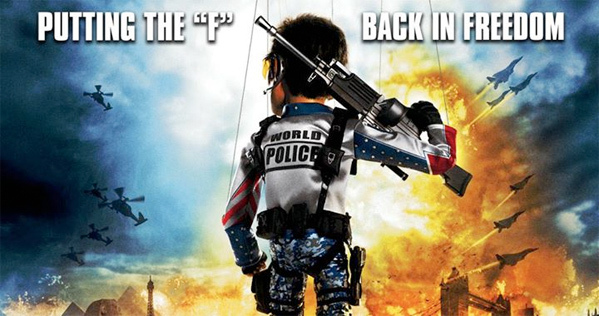 In response, James Wallace of the Alamo Drafthouse theater in Dallas / Fort Worth will be showing Matt Stone and Trey Parker's 2004 puppet comedy, Team America: World Police, instead. Take that, North Korea! The post explains the basics: "For the record, our plan was to still show The Interview…unfortunately these decisions aren't always ours to make. But in light of these recent events, we only have one thing to say: 'AMERICA F*** YEAH!'" They add that the "show is FREE, because you can't spell 'FREEDOM' without 'FREE.'" Indeed. To get tickets before they run out, click here. If only Drafthouse could all of a sudden offer Team America at all of their theaters nationwide in place of The Interview, that would be perfect. That kind of request may not be financially viable, but it would be a great response to the fact that The Interview had to be pulled from theaters because North Korean hackers were upset. Read more on the release cancellation. We just want to point out how awesome it is that Drafthouse is showing Team America instead. Good move. This is awesome. Maybe we should threaten to torture Dennis Rodman. That will get the North Koreans attention in return too. I think Seth Rogen and James Franco should go to Texas and attend the showing of this movie as a protest to Sony. Have they released their own statements? I figured they'd agree with Sony's decision. Those 2 strike me as pussys, Im sure they are actually scared right now. i swear people are missing a lesson in this, it's like people done abandonded the responsibility thats accompanied with freedom, just imagine the backlash if someone made a flick about obama getting assassinated for humor sake..never heard queen elizabeth's crown taken that far but because its hostal country with seperate views and policies somone really wrote off on approving this film from the jump...action has a reaction! You know what's the beauty of Team America is tho, it makes jokes at everyone, so it's not like you can point fingers at anyone. WOW! We are getting ballsy. Well done. I'm sure it's a better movie anyway. lol - how very Texas. I have now coined a new tourism slogan... "Texas... America's balls." You go Tejas.